Food courts used to be synonymous with the greasy, cheap fast-food chains you’d binge on while shopping at your local suburban mall. 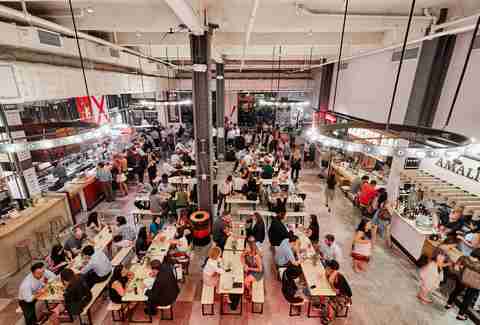 But today, food halls are a nation-wide culinary sensation led by celebrity chefs and innovative start-ups alike. 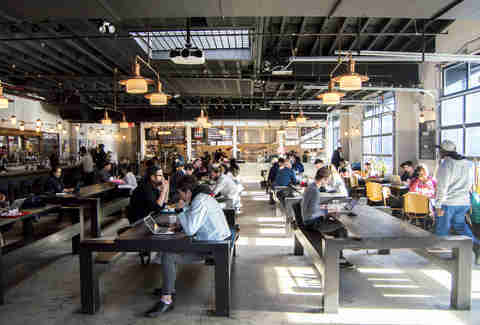 New York City is at the forefront of that movement, with a record of 19 food halls, four of which debuted earlier this year, and five more planning to open by 2018. With many of the city's halls housing as many as 30 vendors, it can tough to figure out how to spend your time and money. That's why we taste-tested our way through all of them to show you what you absolutely can't (and can) miss. Most popular vendor: No surprise here -- the first outpost from the LES deli icon, Katz’s Delicatessen, attracts all the crowds at this 60,000-square-foot market with its famous mile-high pastrami sandwiches. Most underrated vendor: Jianbing Company offers unique, Shanghai-inspired street food that stands out among the hall’s 39 other vendors. Order the jianbing, and watch as a perfectly thin crêpe gets filled with 13-spice pork, chili flakes, zha cai (pickled mustard root), egg, scallion, cilantro, and crispy cracker. Overall best vendor: There’s no beating Pierogi Boys. Using their grandmas’ recipes, the two Polish newcomers behind this aptly named stand roll and stuff plump potato dumplings before topping them with things like bacon, sour cream, and chives. 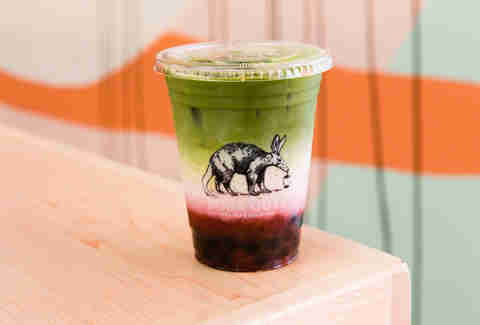 Most popular vendor: At their third location, bubble tea-specialists Boba Guys draw in lines of people waiting to taste the strawberry matcha latte or the sea salt chocochata (horchata with chocolate). Most underrated vendor: The brainchild of the East Village’s Izakaya and Japanese chain Samurice, Izakaya Samurice serves an inventive menu of miso soups, bento boxes, and Japanese curry rice. But your attention should be directed to the ochazuke -- made like drip coffee, the dish involves hot dashi soup broth poured over a filter of bonito flakes into cups filled with cooked rice balls. Overall best vendor: Nom Wah Kuai, a spin-off of the 1920 dim sum favorite Nom Wah Tea Parlor, takes the prize for its diverse lineup of dumplings and rice bowls. The spicy tofu rice bowl and the shrimp and snow pea leaf dumplings are both top picks. Most popular vendor: You probably never thought you’d be able to get a fancy grilled cheese while waiting for your delayed train, but MeltKraft, located inside this underground Columbus Circle food hall, lets you do just that, offering line-worthy panini-style sandwiches like the Valley Thunder, with 12-month Cheddar cheese, beef brisket, baked mac & cheese, and the Brielle, with brie, cranberry chutney, caramelized onions, and toasted pine nuts. Most underrated vendor: Newly opened this spring, the second outpost of the East Village’s popular Arepa Factory is the place to grab the perfect on-the-go food: Venezuelan arepas (cornmeal cakes filled with a variety of meats, cheeses, and vegetables). The Pabellon with shredded beef, black beans, sweet plantains, and Guayanés cheese is a must. Overall best vendor: The latest addition to the Bolivian Llama Party chain goes above and beyond its fellow food stalls by serving authentic salteñas, empanada-like Andean pastries. Get the chimba salteña stuffed with free-range chicken, aji amarillo, hard boiled egg and thick gravy, followed by the maracuyá lemonade, a blend of passion fruit, lemongrass, and banana passionfruit. Most popular vendor: At this smaller FiDi hall, you’ll find Artichoke Pizza is just as popular with the lunchtime rush as it is with the late-night crowd. 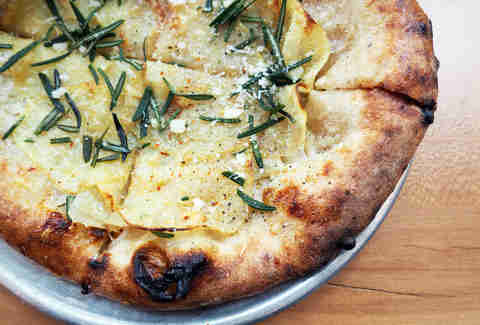 A thick slice of the classic creamy artichoke is the way to go, no matter the time of day. Most underrated vendor: From dumplings to noodle salads, Beyond Sushi’s fifth location offers a little bit of everything, but its signature vegan and vegetarian sushi is where it really excels. The Sunny Side roll with black rice, sun dried tomato, avocado, butternut squash, and almond pesto is always a solid choice. 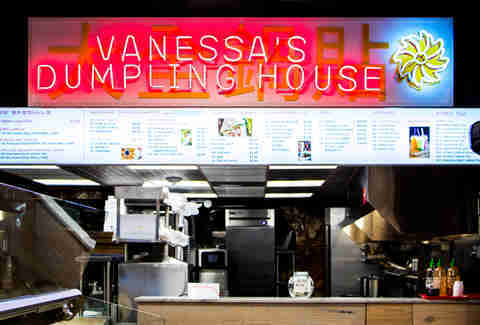 Overall best vendor: All hail, Vanessa’s Dumplings! This Chinatown landmark’s doughy dumplings are your best bet in the market. Opt for the chive and pork variety (just $1.50 for four! ), and a fluffy sesame pancake (for just a dollar). Most popular vendor: Union Fare’s unique layout sets it apart -- instead of an array of different vendors, each stall is labeled by the type of food it offers, such as salads, poke, pizza, and so on. But most people recognize this gastrohall for its Bakery’s colorful croissants, which took Instagram by #foodporn storm. Highlights include: The red velvet croissant filled with cream cheese custard, and the birthday cake croissant (stuffed with rainbow sprinkle cream, then dusted with pink sugar). Most underrated vendor: The Poke counter is no trip to Hawaii, but it still offers a solid take on the ever-popular raw fish dish. Your best bet is the Wipeout -- ahi tuna, sesame seeds, and crunchy Chinese fried noodles. Overall best vendor: The toast trend shows no sign of slowing down, as evidenced by the hall’s dedicated Smash Bar. Expect tartines piled with fresh produce, including strawberries, blueberries, and blackberries with ricotta and honey, or burrata, cherry tomato, and balsamic vinegar. Most popular vendor: At Avocaderia, located inside this multi-building complex, you can get all manner of avocado dishes (including some you may have never wanted), like Mediterranean toast (tapenade, sun dried tomatoes, avo mash, feta, pistachio dukkah) or an Avoburger (two avocado halves sandwiched with salmon, herb yogurt, watermelon radish, arugula, and lime citronette, served on a bed of baked pita chips). Most underrated vendor: Ends Meat, a whole-animal salumeria selling Italian-style dry-cured meats by the pound, isn’t your typical butcher shop. Its best-kept secret is a small yet mighty menu of sandwiches; opt for the Hogfather, stacked with fiocco, pancetta, and melted provolone. Overall best vendor: Kotti Berliner Döner Kebab wins this round for its organic kebabs. Try the namesake one, with tender slices of 18-hour, spit-roasted chicken, crumbled feta, pickled red-cabbage slaw, roasted veggies, dill yogurt, and a spicy harissa sauce in a pide pocket or on a pretzel bun. 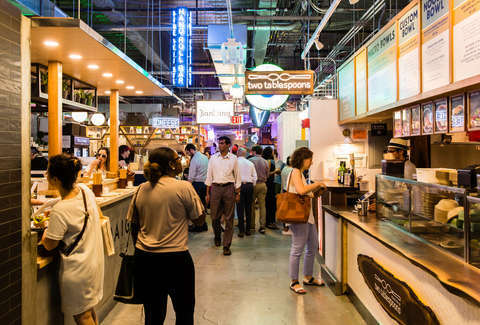 Most popular vendor: This sprawling Brookfield Place food court is a home to plenty of big-hitters like Parm, Blue Ribbon Sushi, and Mighty Quinn’s BBQ. But despite the fierce competition, Dos Toros Taqueria comes out on top, drawing the largest crowds for its California-style burritos stuffed with ingredients like braised pork carnitas, rice, black beans, guacamole, peppers, pico de gallo, and more. Most underrated vendor: Mini-chain Num Pang, which specializes in Cambodian-inspired sandwiches, is often overshadowed by some of the hall’s bigger names, but be sure to make a beeline for the coconut tiger shrimp sandwich with pickled carrots, cilantro, cucumber, and chili mayo on a semolina roll. Overall best vendor: LA-born chain Umami Burger is your go-to when you want a super-indulgent burger. Its thick patties are layered with rich toppings like beer-Cheddar cheese, bacon lardons, smoked-salt onion strings (on the Manly Burger) and truffle cheese with braised short rib (on the Royale). Most popular vendor: At noodle maven Ivan Orkin’s Slurp Shop inside this chef-heavy westside hall, classic shoyu ramen reigns supreme. You’ll generally find a crowd waiting for bowls full of rye noodles and pork belly in a fatty dashi-chicken broth. Most underrated vendor: El Colmado is all about the Spanish tapas. Come between 3-7pm on weekdays for oyster happy hour, and stay for the albondigas (lamb meatballs) and the gambas al ajillo (Gulf shrimp and guindilla peppers covered in garlic olive oil). Overall best vendor: Is there anything Orkin can’t do? His latest venture, a pizza stall called Corner Slice, opened in March to great fanfare. Its square pizzas are made with artisan flour, so the dough is light and easy to digest, and the simple menu -- tomato, mozzarella, and white -- puts the focus on the flavor rather than the fancy toppings. Most popular vendor: Brooklyn’s Gotham West offshoot is already garnering attention for the wood-fired, brick-oven, Neapolitan pies at Apizza Regionale. Go for the Calabrian (soppressata, mozzarella, caciocavallo, oregano, chili-infused local honey) and the patata (yukon gold potatoes, caramelized onions, aged Gouda, fried rosemary). Most underrated vendor: Indian ice cream joints are hard to find in NYC, which is why Malai is such a pleasant surprise. The four-month pop-up serves Indian-inspired scoops including masala chai, golden turmeric, and orange fennel, as well as trendier flavors like rosé with cinnamon roasted almonds. Overall best vendor: Helmed by Dinosaur Bar-B-Que’s John Stage, Flip Bird boasts some of the borough’s best Southern-style chicken. The menu is broken down into fried chicken and rotisserie chicken categories, of which the three-piece fried chicken platter and the Egg & the Bird sandwich (crispy chicken breast, bacon and a sunny-side egg) are go-to items. Most popular vendor: At this inconspicuous second-floor space in Times Square, summer staple Luke’s Lobster garners long lines for its loaded lobster rolls filled with chunks of lobster tossed in mayo and a light herb butter. Most underrated vendor: Dough puts all other desserts to shame; the massive, inventive donuts (like the Dulce de Leche with toasted almonds) are so dense they could be a whole meal in themselves. Overall best vendor: Thanks to Ippudo’s fast-casual concept, Kuro-Obi, you don’t have to wait for hours to score a seat at the original East Village ramen shop. Opt for the Aka-Obi, a creamy chicken broth, with scallions, mushrooms, zuzutto noodles, chashu pork, and a spicy miso paste. To finish it off, add an umami egg. Most popular vendor: Mini-chain Mighty Quinn’s knows how to do good BBQ, so it’s no surprise it’s the most popular stand in this beer hall/event space. Opt for smoked slabs of brisket paired with a side of slaw and a pint of local craft beer from the likes of Other Half, Sixpoint, Grimm Ales, and Brooklyn Brewery. Most underrated vendor: Just opened in July, Brooklyn Pizza Crew is the newest addition to Berg’n’s ever-evolving family. Standout square pies include the Tartufo (mozzarella, white truffle oil, wild mushrooms, and rosemary) and the Paesano (roasted red peppers, Italian sausage, crimini mushrooms, mozzarella, and basil). Overall best vendor: Berg’n’s offshoot of the West Village’s Lumpia Shack shines above all the other vendors thanks to its Filipino-inspired fare of spring rolls, rice bowls, and skewers. Don’t miss the Sisig’n Bowl, layered with heritage pork hash of jowls, ears, and pork belly, egg yolk, and a calamansi citrus dressing. 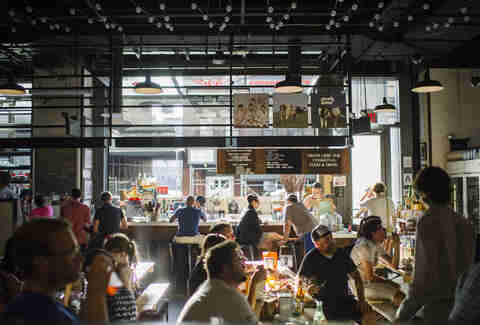 Most popular vendor: When Gansevoort Market moved from its prime Meatpacking address to 14th Street last year, it had to up its game to compete with next-door neighbor, OG food hall Chelsea Market. The strategy: New purveyors like La Sonrisa (more on that later) were added to the mix, and the best-selling stalls were brought over and expanded to meet demand. One such long-standing venue is Mission Ceviche, which boasts crowd-favorite Peruvian cuisine. The seafood ceviche looks more like a poke bowl, but it’s the freshest around -- just ask for the catch of the day (paired best with aji amarillo yellow pepper sauce). Or, if you’re not feeling fish, opt for the seco norteño, a classic Peruvian dish featuring slow-roasted beef, criolla salad, and rice. 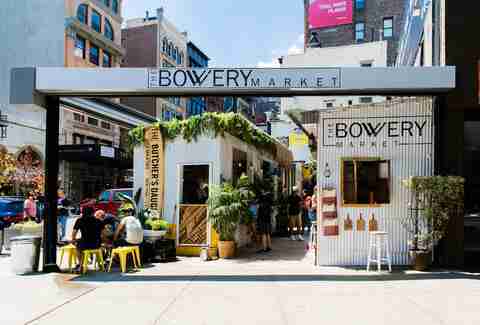 Most underrated vendor: The blink-and-you’ll-miss-it Burger Inc. is one of Gansevoort Market’s hidden gems. The beef is thick and juicy and can be topped with things like bone marrow and white American on a brioche bun (aka “The Don”), with a side of the Dynamite Mac (fried balls of chilli pepper mac & cheese). Overall best vendor: The secret behind La Sonrisa Empanadas’ success is its South American empanada recipe, which was passed down generation by generation in owner Ariel Rodriguez’s family. The coconut curry chicken and pulled pork empanadas are the most popular, but the elote (sweet corn) with cotija cheese, pecans, and lime shouldn’t be overlooked. Most popular vendor: Popular Bushwick pizza joint Roberta’s created major hype when it launched its first brick-and-mortar outpost across the East River. But don’t worry, it didn’t leave its beloved pies in Brooklyn. You can still order the famous flaky garlic knots and soppressata, chili, and honey-topped Bee Sting pizza. Most underrated vendor: We have a tie. The vegetarian bowls at Two Tablespoons and the soup at Good Stock are both so outrageously good, you have to get both. (After all, who can dispute the classic soup and salad combo?). Start with the Mediterranean Sun Circle bowl of quinoa, fingerling potatoes, hummus, olives, red pepper spread, baby greens, cherry tomatoes, cucumbers, and feta cheese. Then, pair it with a small cup of Good Stock’s roasted tomato soup with Gruyère croutons. Overall best vendor: Daniel Delaney (of the recently closed but greatly beloved BrisketTown) is behind the knockout fried-chicken concept, Delaney Chicken. Soaked in a brine for six hours, the chicken is then battered with buttermilk-cayenne and fried on the spot. If you can handle the heat, kick the sandwich up with havarti cheese, pickled jalapeños, and spicy mayo. Most popular vendor: After co-founding Copenhagen’s award-winning restaurant Noma, Chef Claus Meyer set his sights on America, bringing his New Nordic fare to NYC last summer. The must-visit stand here is The Bageri (bakery), which is known for its signature kanelsnurrer -- think of it as a Danish cinnamon roll of braided pastry dough infused with cinnamon, sugar, and cardamom. Most underrated vendor: Open Rye is all about smørrebrød. They may seem dainty, but these rye bread open-face sandwiches will definitely fill you up with hefty toppings like chicken-liver mousse and rhubarb compote, beef tartare, and pickled herring. 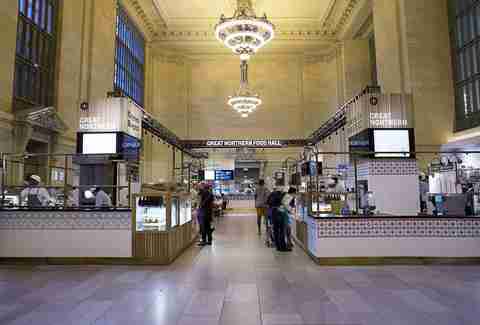 Overall best vendor: At the heart of this Grand Central court is the Grain Bar, which offers bowls of pearl and black barley porridge. For something savory, try the spinach, dandelions, goat cheese, and aged Havgus dish, or for something sweet, order the øllebrød, a cold pudding of vanilla-milk foam, sea buckthorn (tart orange berries), tarragon sugar, and caramelized rye. Most popular vendor: Rows of oysters, sea urchins, and line-caught fish chill behind the Lobster Place's counter at this OG food hall (which has been around since well before food halls were a “thing”), but it’s the massive whole lobsters that draw the most attention. Most underrated vendor: Very Fresh Noodles specializes in Xi’an hand-pulled biangbiang noodles, an essential element of central Chinese cuisine. The Tingly Cumin Lamb Soup is the bowl to get -- the rich meat is soaked in Shaoxing wine and seasoned with Chinese five-spice, star anise, ginger, and soy, and the noodles are topped with cumin, Sichuan peppercorns, and chili oil. Overall best vendor: Out of the 35 vendors housed inside Chelsea Market, Los Tacos No. 1 manages to stand out by proving that New York can do Mexican food well. Order from a handful of different tacos, including carne asada, adobada marinated pork, nopal (grilled cactus), all of which come wrapped in homemade tortillas. Once you’ve made your way through the regular menu, come back for the secret-menu taco, with a shell made entirely of cheese. Most popular vendor: When Mario Batali debuted Eataly’s flagship store in 2010, it revolutionized the restaurant industry. 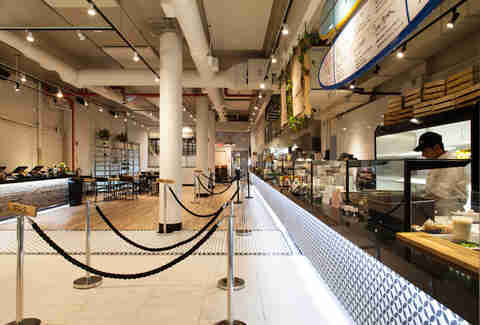 The 50,000-square-foot space by Madison Square Park was the first to mix a retail market (sourcing all its products from Italy) with ready-to-order counters defined by a specific food category (pesce for fish, verdure for vegetables, manzo for beef and meats, etc.). The one that continues to draw in crowds is La Piazza, an enoteca in the center of the complex that has standing tables and a menu of antipasti, including carne cruda (Arcadian beef sprinkled with Maldon sea salt on a crunchy crostini). Most underrated vendor: Manzo, the butcher shop, has been quietly renovated into a full restaurant, serving an expanded menu of charcuterie boards, ragù pastas, and steaks. The Bistecca alla Fiorentina, a brontosaurus-size, 40-ounce Porterhouse rubbed in Tuscan olive oil, is the most impressive plate. Overall best vendor: It may be cliché, but there’s no arguing that La Pasta is the crown jewel of Eataly. While half of the pastas are imported from Gragnano, the others are made daily by the in-house pastaio, Luca Donofrio. From the fresh pasta selection, opt for the spaghetti nero (squid ink spaghetti, rock shrimp, marinated artichokes, and chili). Most popular vendor: It’s no surprise that this European-inspired food hall, underneath the opulent Plaza Hotel, is the grandest in the city. Throughout the classic space (think mosaic floors, marble counters), you’ll find sophisticated vendors like Lady M, a French-Japanese fusion bakery that churns out the Plaza’s finest pastries. 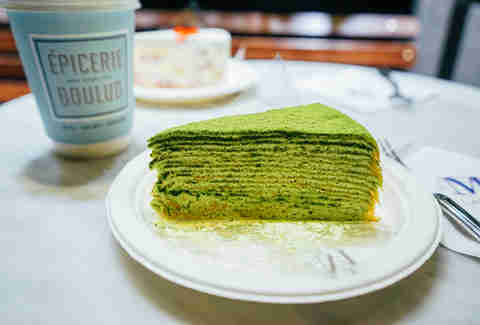 Of all the options, the green tea mille crêpe is the most decadent. Most underrated vendor: The Tartinery menu may look sparse at first, but what it lacks in quantity it makes up for with filling, open-faced sandwiches like one with avocado, asparagus and poached egg, or lobster with grapefruit, edamame, arugula, and wasabi mayo. Overall best vendor: Chef Daniel Boulud’s second outpost of Épicerie Boulud is a casual cousin to his more formal restaurants, and an ideal spot to taste his savory quiches, salads, and sandwiches without spending an entire paycheck. The Parisian quiche (jamon, Gruyère, leeks, mushrooms) makes for a balanced breakfast, while the niçoise salad will give you all the fuel you need to tackle the Midtown crowds at lunchtime. Most popular vendor: Sushi on Jones is not only NYC’s first outdoor sushi bar, it also lays claim to one of the city’s most impressive feasts. At the small, six-seat stand inside this open-air market, you can splurge on the $50, 12-piece omakase meal that includes scallops, crab, hamachi, uni, eel, botan shrimp, wagyu, and more. Just make sure to leave plenty of time, as it takes half an hour to prepare. Most underrated vendor: Alidoro is not your average sub shop -- the old-school Italian eatery opened its original SoHo spot in 1986 and has remained a landmark ever since. At this offshoot, each of the 24 large sandwiches incorporate imported Italian ingredients, like the salami, mozzarella, artichokes, and olive paste in the Sofia. Overall best vendor: Homemade parathas (round Indian flatbread) are the focus at Parantha Alley. Meat-eaters should get the Keema (chicken, cilantro chutney, mango pickle, cucumber raita, and fried green chili peppers), while vegetarians can opt for the goat cheese with pecans, dates, and honey. 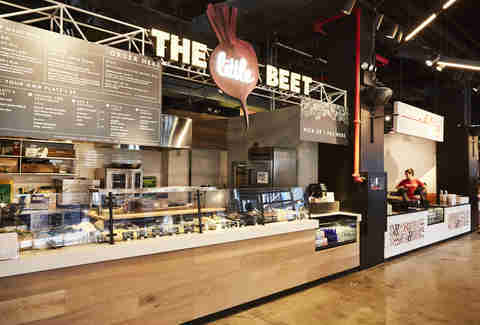 Most popular vendor: At this newly revamped Penn Station-adjacent food court (complete with an outdoor patio and beer garden) your best bet is the second location of veggie-centric eatery, The Little Beet. The café caters to a healthier clientele, who line up for its gluten-free bowls and rolls, including the salmon sushi burrito with avocado. Most underrated vendor: Looking for a pizza fix before you board Amtrak? Skip the dollar slice joint and head to the Pennsy's outpost of Union Square-based Ribalta, which offers personal-sized Pizza in Pala (oblong-shaped pies with a crust that's crispy on the outside and soft on the inside). Overall best vendor: When the Cinnamon Snail’s food truck closed in 2015, it seemed like the end for the vegan eatery, loved by vegans and non-vegans alike. Thankfully, it made a comeback with a stand inside the Pennsy, serving sandwiches like The Korean BBQ Seitan and burgers like Beastmode Burger Deluxe, an ancho chili seitan burger coated in maple hickory BBQ sauce and topped with jalapeño mac & cheese, bacon, and chipotle mayo on a grilled pretzel bun. Chelsea Bengier is a travel and food writer based in Brooklyn. She’s still trying to decide which coast is the best coast. Follow her on Instagram and Twitter.